We could all use more closet space, right? (And to those of you who disagree: You’re very, very lucky and the rest of us are super envious. Enjoy all that space!) This post will explore a simple product that can effectively double the amount of clothing storage you get out of a typical closet. It’ll also make sorting your clothes much easier, and even save you time with outfit planning. A closet doubler can be found for around $10 at a typical hardware store or home goods retailer. You can spend much more on pricier products, but a simple, inexpensive closet doubler will go a long way. We’ll explore how to get its maximum usage below. WHAT’S A CLOSET DOUBLER? WHAT CAN IT DO FOR ME? A closet doubler is, at its essence, a second closet rod that you hang from the existing closet rod that’s already built into the structure of your closet. You can use a doubler for a single segment of the closet, or to double up the entire rod. A doubler can also be used in larger, standing wardrobes. Most closets leave a ton of vertical space vacant that could, ideally, used to store more clothes and other items. 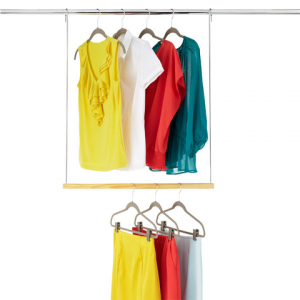 With a doubler, space that’d otherwise be occupied by nothing can be used to hang more clothing. Once your doubler is hung, take the time to do a reorganization of your closet: Put your tops, sweaters, shirts, and blouses on the top rod, at eye level. Place your bottoms, skirts and the like, on the second rod, below. A good rule of thumb is to hang like with like: All sweaters together; all short- and knee-length skirts together. The more color-conscious among you will also get a kick out of color-coordinating your wardrobe so that you can instantly glance inside and see, for example, all your red tops if that’s the kind of mood you’re in. Depending on the type of closet doubler you’re using, you can leave a portion of the existing closet rod for full-length garments like dresses, pants, long skirts or coats. Then, you can double the rest of the rod for shorter items. For the most efficient use of space, we recommend closet doublers that are adjustable in both width and height. A closet doubler can also help you plan outfits more easily, without having to take clothes off their hangers. Plus, you can use the doubler to help you plan outfits in advance: Hang what you want to wear in the upcoming week using the closet doubler: Tops above with bottoms below in pre-planned outfit combinations. This will save you time (and thus stress) in the mornings. Set aside a bit of time during the weekend to get your outfits planned for the week to come; make sure you check your weather app to plan appropriately! A closet doubler will help make you less reliant on cubbies, drawers, and boxes for clothes storage. Since these necessitate folding the items there to contain, that means you’ll need to spend time ironing or steaming out creases before you wear them. Creased or crumpled clothing will need to be amended or replaced sooner while hanging your clothes is much better for them in the long term. Plus, you’ll have everything where you can see it! That’s a huge bonus that’ll help you be creative in your outfit planning, and a guarantee that you’ll wear things that you normally might not that were tucked away somewhere out of sight (or were so creased through folding that you didn’t necessarily feel like spending lots of time ironing). 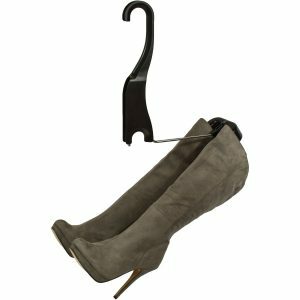 And of course, a closet extender is a perfect opportunity to use the Boot Butler! Double a portion of your existing closet rod like on this photo; use the top part for blouses, shirts and the like. Then, use the bottom portion to hang the Boot Butler. 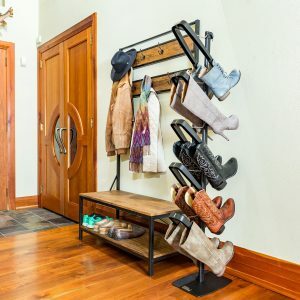 Since the Boot Butler is modular, hang as many pairs of boots as you can fit vertically, and then the remaining pairs can hang alongside the first. Your boots will be off the floor, within eye’s view and stored in a position that will extend their life and wear. You can also use hanging organizers such as hanging shelves in conjunction with your closet doubler for some extra storage options. 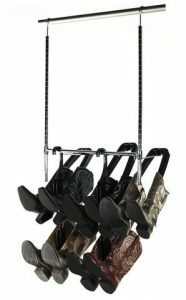 Keep toiletries, cosmetics and grooming products in a hanging organizer to get more out of your closet space. You can also install a closet doubler with a hanging organizer in your other closets to hold toys, small electronics, and other items. And since everyone could use more hanger space (except you lucky few that don’t! ), a closet doubler is one of the most cost-effective ways to maximize your storage without any construction or time-intensive DIY projects.